The Blue Nile River meander in the Southeastern Sudan consists of a dendritic drainage pattern that drains a basin bordered by regional Horst and Graben structures developed in Ingassana hills. It is assumed that the drainage system in the study area host gold-rich placer deposits, while it drains gold-bearing rocks. Satellite processed images were used to identify the main features regionally associated with the Quaternary deposits. 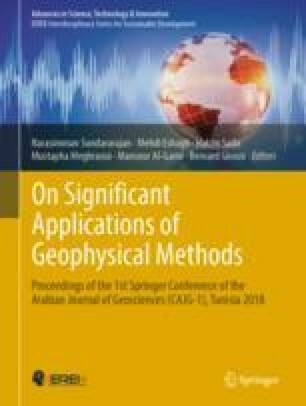 Using Electrical Resistivity Tomography (ERT) survey for mineral exploration is feasible in the current study because the ground conditions of the study area are favorable for carrying out the geophysical survey. Interpretation of ERT data collected in the dry and the semi-dry areas of the streambeds in the study area were helpful for the characterization of sub-channel structures and defining the thickness of the gold-bearing deposits. The geochemical analysis of 110 placer gold samples taken from the superficial deposits and residual soils using an auger drilling machine shows promising results and indicates the existence of gold-rich placer deposits with recognized tonnages. The thickness of these deposits estimated by ERT and verified by drilling ranging between 3 and 9 m. These thicknesses have been used to calculate the placer deposit tonnages of 253,125 and 1,269,570 tons for the island locality and khor area with gold reserve of 0.76 and 3.94 tons respectively. We would like to express our deepest thanks and gratitude to Eng. Elhadi Abaker, Direcor General of Dallow Company for Trade and Constructing for granting us a permission to publish results of its investment project in Blue Nile State, thanks and appreciation for Dr Khalid M. Kheiralla for satellite image interpretation and geological background review. Sincere thanks to El Modather Mohamed Al-Amin (Mining Engineer), Abdelhalim Abou (Mining Geologist), Musaab Hussein (Hydrogeologist) and Zohaer Sowar (Mining engine er) for hardwork during the fieldwork time and analysis of results afterward.